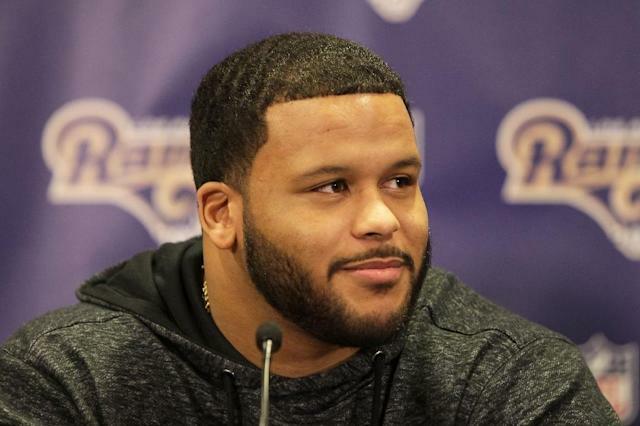 Los Angeles (AFP) - Aaron Donald, a Pro Bowl defensive end selection in each of his first four NFL seasons, has agreed to terms on a six-year contract extension with the Los Angeles Rams, the team announced Friday. The 27-year-old defensive lineman was the 13th player selected in the 2014 NFL Draft as well as the NFL's 2014 Defensive Rookie of the Year. According to the NFL Network, the deal is worth $135 million with $87 million of it guaranteed, including a $40 million signing bonus. ESPN said the contract would make Donald the highest paid defensive player in NFL history. In 62 career NFL games, Donald made 205 tackles, 39 of them quarterback sacks, and forced nine fumbles while recovering two. His sack total is the most by any interior lineman in the NFL during that span. Rams coach Sean McVay said Donald needed to report by the end of the week to have any chance of being on the field when the team plays its season opener at Oakland on September 10. The Rams split four pre-season contests without Donald, the last of them a 28-0 loss Thursday to New Orleans.